Picking the grapes at the right time is critical. Timing depends on the maturity of the grapes, the outlook for inclement weather and the availability of a picking crew. The most critical aspect is grape maturity assessment and takes weeks. Weather and soil humidity: how much sunshine have the grapes received over the growing season and how much water was added through irrigation to fine-tune the grapes’ condition during the last 4-5 weeks? Sampling: How do we sample the grapes to be analysed, so the sample represents the range of maturity in the entire vineyard?. Chemical Analysis: what chemical measurements do we take to decide whether the grapes have reached maturity and how will the results affect our winemaking process? 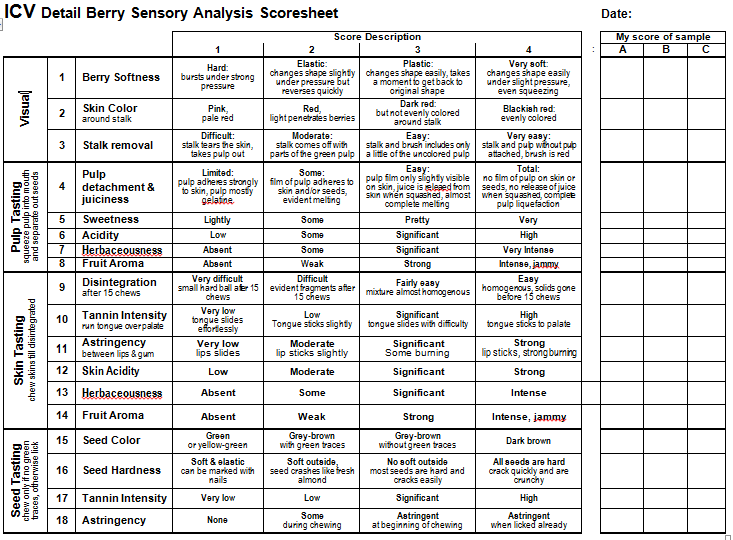 Taste Analysis: how can we consistently evaluate the taste of the grapes during their final weeks of maturation? Finally, we try to forecast, as we measure, when we will likely end up picking and what volume we can expect from the harvest. Quality, date and volume forecasts help us organise the picking crew/party and make decisions on the subsequent fermentation processes. The following paragraphs explain what we do in detail. We described on the last page in the vineyard section how we monitor weather conditions during the growing season. A critical weather-related leading indicator for maturity used throughout agriculture is Cumulative Growing Degree Days (“CGDD”). We track this number throughout the year and pay particular attention during the last 4 weeks. The goal is to reach around 2000 CGDDs before picking. We can increase soil humidity with irrigation. We do not irrigate the vineyard except in very dry seasons and during the final weeks of maturation if we need to prevent sugar from shooting beyond our target of 24 Brix before the grapes have reached physiological maturity (as measured by Taste Analysis). As a consequence, we track CGDDs, temperature lows and highs, humidity lows and highs and irrigation amounts during the final weeks. In 2017 we selected, as in 2016, six sample areas. In the Lower Field: the north-east corner of the long rows to sample the "Freedom" and “4453” roots with 337 cabernet clones. In the north-east corner of the short rows to catch the “110R” roots with "Dr Emmet Rixford" cabernet clones, and the boundary between the short and long rows to catch the 2009 replantings, i.e. clone 337 on 4453 roots. In the Upper Field: The first half rows for each varietal. The graphic below shows the three maps and the selected sampling areas. The assumption is that differences in the maturity levels now, near picking, would be similar to the differences which were readily observable during veraison. In 2018 we changed the selection of sampling areas because, both in 2016 & 2017 the sample results did not match well with the observations at harvest (for one, the final projected Brix levels were 2-4 Brix lower than what we got at harvest). So, in 2018 we sampled each block in the lower field uniformly, and we sampled the middle row of each block in the upper field. For each block, we collect weekly samples of 110 berries each, 100 berries for chemical analysis, 10 berries for taste analysis. We take a whole range of measurements and from them calculate sample averages. Sugar content (Brix): Sugar content of the grape juice is the most straightforward measure of maturity. Usually, wine is picked when the sugar level has reached 22-28 Brix depending on the style of the wine desired. Our target is 24 Brix. Acidity (pH and TA). At maturity, we expect a pH range of 3.3 to 3.5 and a TA range of 6 to 9 [g/L]. We also capture Tartaric, Malic & Gluconic Acids, but are not yet sure what we do with the numbers. Finally, we capture Volatile Acidity, to detect possible infestations. Nutrients (Alpha Amino Acids and Ammonia which sum up to YAN, Yeast Assimilable Nitrogen). These are vital benchmarks for nutrition available for yeasts during fermentation. We target YANs of 250 ppm, below that we need to add nitrogen during fermentation. Projected Anthocyanin content (tANT): Anthocyanins are responsible for the colour intensity and mouthfeel of the finished wine. We are experimenting with this measure. We press the berries, the expose the skins and seeds to an alcohol solution at 130 OF for 2 hours, then press again and measure the phenolic components extracted by the alcohol solution. We describe the laboratory processes the Laboratory Section. Step 1: Visual Inspection. Inspect the 4-5 berries and rate 1) the elasticity of the berry, 2) the colour of the skin around the stalk and 3) how easy it was to remove the stalk. Step 2: Pulp Tasting. Squeeze the pulp of the 4-5 berries into your mouth and separate out the seeds with your tongue and keep the seeds for the last step. While doing that evaluate 4) how easy the pulp detached from the skin, 5) the sweetness of the juice, 6) its acidity, 7) its herbaceousness (herbal aroma) and 8) its fruit aroma. This takes some experience as all the ratings have to be done within 10 seconds. Step 3: Skin Tasting. Put the skins into the mouth and chew them hard 15 times or until they have entirely disintegrated into mush. Then evaluate 9) the level of disintegration after 15 chews, 10) the tannin intensity, 11) the astringency, 12) the skin acidity, 13) the herbaceousness and 14) the fruit aroma. Step 4: Seed Evaluation. First, rate 15) the colour and 16) the hardness of the seeds. If the rating is 3 or 4, chew the seeds and rate 17) their tannin intensity and 18) their astringency. As the berries mature, the ratings move from 1 towards 4. Often not all ratings reach 4 before the Brix level of the berries becomes excessive or the weather turns too cold to finish maturation, and the grapes need to be picked regardless. The final scores provide input to winemaking to adjust the fermentation and maceration styles. We used this ICV process from 2013-2016 and then concluded it was not appropriate for our situation. We have far too few samples to accurately benchmark our judgements. So in 2017, we returned to a more straightforward approach: we rate how berries look, feel and taste using a range of 1 to 4 (from immature to fully mature). Essentially, we use an abbreviated ICV process. In summary: We endeavour to pick when the CGGD passed 2000, the sugar levels have passed 24 Brix, the average of average ICV scores passed 3.5, and the Anthocyanin levels are peaking. Our quality forecasts are based mainly on the physical appearance of the bunches (e.g. mildew damage, bird damage, shrivel) and the projected potential Anthocyanin levels. Our harvest date forecasts are based on the observed Brix level and the historical experience on how fast Brix levels increase over time at given ambient temperatures. The graphic on the right shows that 2012-2015 the sugar levels have increased on average between 0.8 to 1.4 Brix/week. However, as shown on the right, there is no convincing correlation between that number and the average temperature during the week. We also consider the observed evolution of potential Anthocyanin content and estimate when the peak will likely occur. Our gross volume forecasts are based on estimates for each vine at veraison how big the current fruit load is as a percentage of estimated maximum load and averaging these numbers over each row. Then we estimate the maximum fruit load in pounds for each varietal and multiply it with the average observed fruit load to get to an estimated harvest volume per row. The quality and date forecasts are updated every week as we take and analyse our samples. Before we can record berry test results, we need to create records in the BerryTestActions table for each harvest block. For each block, we create a record and enter the Test Date and the harvest block. In 2018 temperatures were high during the winter but significantly below average in March & April. Summer was characterised by slightly lower-than-average temperatures and no heat-spikes. Growing Degree Days never caught up to average by harvest. The result was an early bud-break but late harvest of high-quality fruit. Note, the late maturation of the Petit Verdot block. The next screenshot shows the potentially extractable Anthocyanins, the berry composition and their size. Of note are the healthy Extractable Anthocyanin levels and the low YAN numbers, particularly in the lower field. Pick the Merlot and Cabernet Franc in Upper Field on September 21 with Potential Anthocyanins peaking around 2000. We estimated sugars around 22.5 - 23.5 Brix and pH relatively high in the 3.4 - 3.7 range. With an estimated 100% fruit load on Merlot Uber at 10 lbs/vine, Merlot at 5 lbs/vine and Cabernet Franc at 7 lbs/vine, we estimated gross harvest yield at 380, 350 and 200 lbs respectively. Pick the Petit Verdot on October 21. Brix measured 18.5 and pH 3.2 3 weeks earlier. We estimated 100% fruit load yield at 9 lbs/vine to result in an estimated gross harvest yield of 170 lbs. To estimate the size of the harvest, we estimated fruit load percentages for each plant on September 18 (at 50% veraison). This screenshot shows the estimated fruit loads. The next page will show that some of these estimates were significantly off the mark: actual Brix and pH levels turned out almost 10% higher.